There are only five days to Valentine’s Day. Those of you who are shocked by that revelation are prime targets for Valentine’s Day related spam and phishing attacks as hackers hope to catch you with your guard down for this day of romance. Messages targeting Valentine’s Day are expected to quadruple globally in the coming days – in part because cyber criminals are adept at targeting holidays and current events as bait for attacks. An offer for a dozen roses for $5 might get some traction any time of the year, but with the clock quickly counting down to Valentine’s Day it has much higher odds of duping frantic lovers in search of a last minute gift. 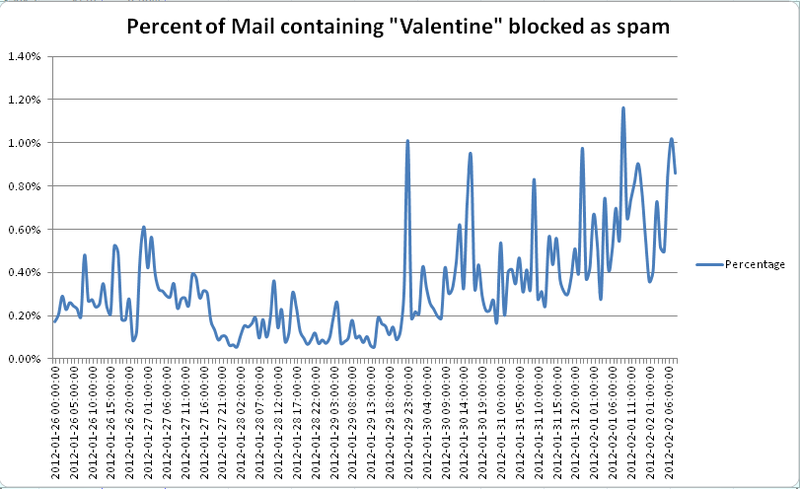 This McAfee chart depicts the rise in messages targeting the word "Valentine". 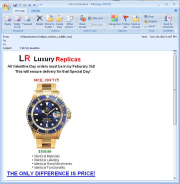 Attackers will send out spam promoting bargains for flowers, romantic dinners, jewelry, or other Valentine’s Day gift related themes. Clicking on the offer might take you to a malicious site that could compromise a vulnerable PC, or it could take you to a site that looks legitimate, and asks for your credit card, and other personal information to “complete the order”. Any holiday that traditionally involves giving and receiving cards is a prime target for cyber criminals. Everyone loves to receive a personalized greeting card – especially if it seems to be from someone that may be romantically interested. Seriously, though, what are the odds that someone you don’t know decided to send you an ecard for Valentine’s Day out of the blue? Right. You'll regret it for more reasons than one if you click on this to buy the replica watch. McAfee outlines some additional threats to watch out for in its blog post. To steer clear of Valentine’s Day cyber threats, follow the basic principles of online common sense. Don’t open emails or file attachments, or click on links from people or sources you are not familiar with – and even if you do know the sender, think twice about whether that person would really send you a Valentine’s Day email. Another basic rule is that if it sounds too good to be true, it probably is. Don’t fall for unbelievable last minute Valentine’s Day gift ideas no matter how desperate you are for a gift. Protect your wallet, your identity, and your heart by avoiding Valentine’s Day cyber scams.